These trails were usually narrow, following the topography of the land. Sometimes, over ‘a‘ā lava, they were paved with water-worn stones. Alahele (trails) and alaloa (regional thoroughfares) were an integral part of the cultural landscape of South Kona and all Hawai‘i. The alahele provided access for local and regional travel, subsistence activities, cultural and religious purposes, and for communication between extended families and communities. Trails were important features of the cultural landscape. By the early-1850s, specific criteria were developed for realigning trails and roadways, including the straightening of alignments and development of causeways and bridges. The Alahaka Ramp, located near the southern end of the Keanaeʻe Cliffs, is a massive stone ramp that ascends the pali from Keokea into Kiʻilae and connects the 1871 trail to Kiʻilae Village. It is during this time that a series of large-scale government programs were initiated that focused on improvements to public resources, such as roadways. It is one of the significant road construction events of this period. Prior to the construction of the ramp, folks used a ladder or rope to get up the slope. Alahaka ramp was built to allow horses to continue on the trail. The 1871 Trail was used as part of a trade route in Hawaii. Having horses meant that people were able to transport more goods to trade, so it was very important that horses could navigate the trail. Wheeled vehicles did not enter Honaunau until 1918; travel in that area continuing to be by horses, mules and donkeys, as well as by foot. Although the area remained somewhat isolated due to the lack of a cart road, better trails continued to be built for mounted traffic. In 1918 the trail section north of Honaunau was improved for wheeled traffic; however, the section south to Hoʻokena was never modified for motorized vehicles. In 1951, a large earthquake caused an upper section of the ramp to slough off, which over the next ten years, continued to deteriorate. Twelve years later, the newly established National Park, conducted a rebuilding the entire makai (ocean-facing) side with steel rebar, mortar and stones. Each island was divided into several moku (districts,) of which there are six in the island of Hawaiʻi, and the same number in Oʻahu. There is a district called Kona on the lee side and one called Koʻolau on the windward side of almost every island. (Alexander) The moku of Hawaiʻi Island are: Kona, Kohala, Hāmākua, Hilo, Puna and Kaʻū. The Polynesians who came to the Hawaiian Islands were quick to consider the sunny, sheltered Kona district of Hawaiʻi, rising gently to fertile, cloud-covered slopes, as an environment suited to their needs. It was ideal for food crops such as taro, breadfruit, banana, sweet potatoes and sugar cane they brought with them. Its clear, calm waters offered excellent near- and off-shore fishing. This coast became the most densely populated area in the islands and the coveted land of the chiefs. In the centuries prior to 1778, seven large and densely-populated Royal Centers were located in Kona along the shoreline between Kailua and Hōnaunau. These included Kamakahonu at Kailua Bay, Hōlualoa, Kahaluʻu, Keauhou, Kaʻawaloa, Kealakekua and Hōnaunau. The compounds were areas selected by the aliʻi for their residences; aliʻi often moved between several residences throughout the year. The Royal Centers were selected for their abundance of resources and recreation opportunities, with good surfing and canoe-landing sites being favored. The grounds of the Royal Center was centered around the small embayment known as Keoneʻele Cove. Cup holes, which may have held kapu sticks, are noted to the north, east and southern boundaries of this area. It is believed that these kapu sticks demarcated the boundary of the royal area. In pre-contact times, the royal grounds contained several chiefly residences and ceremonial-related structures. Other highlighted sites used by royalty included the Heleipālala fishponds and Keoneʻele Cove canoe landing. A feature found at Royal Centers were fishponds. Cartographer Henry Kekahuna called the Honaunau ponds Heleipālala. These were a number of fish ponds inland from the shore and containing a mixture of fresh and ocean waters. They were probably stocked with fish (most likely ʻamaʻama (mullet) and awa (milkfish.)) Given their location within the royal grounds, an area inhabited and used by aliʻi, the Heleipālala ponds were most likely kapu (prohibited) to commoners. At Hōnaunau was the puʻuhonua, The Place of Refuge, termed the ‘City of Refuge’ by Rev. William Ellis in 1823, with its adjoining chiefly residences and associated with the Royal Center. Hale O Keawe, at the northern end of the eastern wing of the Great Wall at Puʻuhonua O Hōnaunau, was named after and either built by or for Keawe around 1700. In ancient times the Heiau served as a royal mausoleum, housing the remains of deified high chiefs. Historical information indicates that in the area immediately east of the Hale o Keawe was once the location for a ti leaf thatched structure called the “Hale O Lono.” In 1919, archaeologist JFG Stokes was told by elderly Hawaiians that this area was a temple used for the four periods of prayer held monthly for eight months of the year. This intensive agricultural activity changed farming and agricultural production on the western side of Hawai’i Island; the Kona field system was quite large, extending from Kailua to south of Hōnaunau. In lower elevations all the way to the shore, informal clearings, mounds and terraces were used to plant sweet potatoes; and on the forest fringe above the walled fields there were clearings, mounds and terraces. Sweet potatoes grew among the breadfruit. The Alahaka Ramp, located near the southern end of the Keanaeʻe Cliffs, is a massive stone ramp that connects the historic 1871 Trail to Kiʻilae Village. Prior to the construction of the ramp (probably in the mid-1800s,) folks used a ladder or rope to get up the slope. 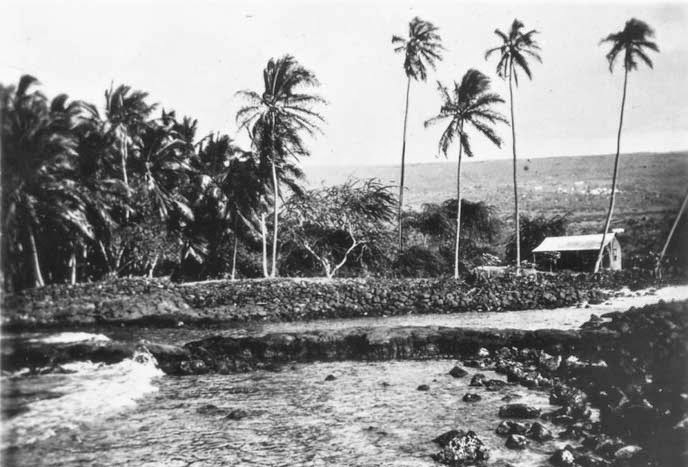 The image shows Keoneʻele Cove and the area known as Kauwalomālie (NPS, 1912.) I have added other images to a folder of like name in the Photos section on my Facebook and Google+ pages. 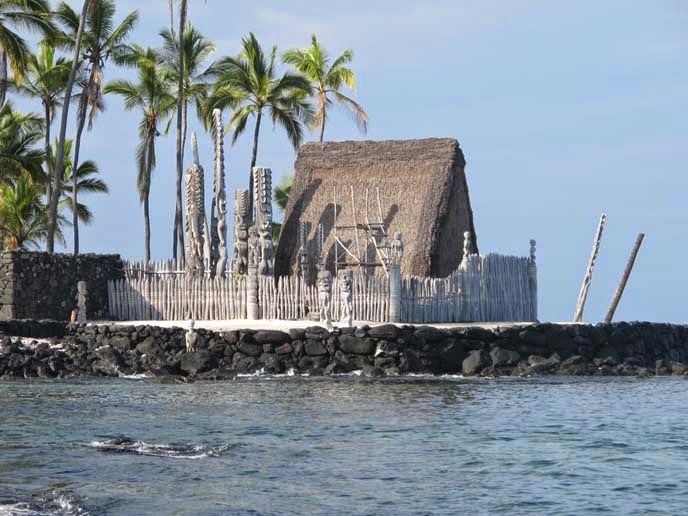 Recognized as one of the significant puʻuhonua, and one that is well preserved and presented for the rest of us to understand was Puʻuhonua O Hōnaunau on the Kona coast on the Island of Hawaiʻi. A structure there, Hale-O-Keawe was erected around 1650 to serve as a temple mausoleum for the ruling chiefs of Kona. It served as the major temple for the “Place of Refuge” until 1819, when the religious laws (kapu) were abandoned. The puʻuhonua was deeded to Miriam Kekāuluohi, a granddaughter of Kamehameha I, in the Māhele of 1848, and it was inherited, upon her death, by Levi Haʻalelea, her second husband. In 1866, the property was auctioned by Ha‘alelea’s estate to Charles Kana‘ina, the father of William Charles Lunalilo. Kana‘ina, however, did not pay the $5,000 bid, and Charles Reed Bishop stepped in to purchase Ha‘alelea’s land for that same amount on April 1, 1867. In 1891, six years after Pauahi’s death, Bishop deeded the land to the trustees of the Bishop Estate who leased it to one of their members, SM Damon. Originally established in 1955 as City of Refuge National Historical Park, Puʻuhonua O Hōnaunau National Historical Park was renamed on November 10, 1978. Further reconstruction consisted of four terraces and a passage between the southern end of the platform and the northern end of the Great Wall. In 1966-67 Edmund J Ladd directed the excavation and re-stabilization of the Hale o Keawe platform. Ladd’s excavations in addition to historical accounts indicated that the platform did not originally have multiple tiers; therefore, the 1967 work restored the platform to its more authentic form that joins the Great Wall on its south side. The image shows Hale O Keawe at Puʻuhonua O Hōnaunau (NPS.) I have added other images to a folder of like name in the Photos section on my Facebook and Google+ pages.